ROCKVILLE, MD—In what researchers describe as a major discovery in the field of dietetics, a study published in the American Journal Of Clinical Nutrition Tuesday linked long-term health benefits to seriously thinking about going vegetarian for a while now. 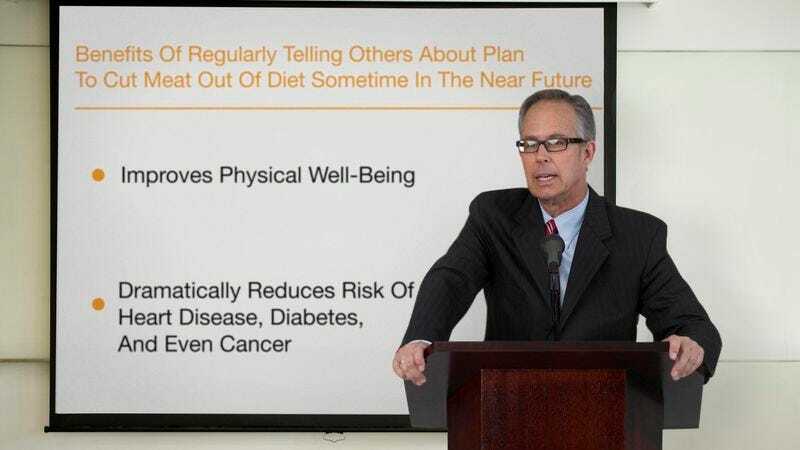 “Our research found that people who actively toss around the idea of cutting meat out of their diet exhibited substantial and lasting improvements in their physical well-being,” said study lead author Dr. Olivia Marlow, adding that regularly telling others about one’s plan to transition to an exclusively plant-based diet sometime in the near future was strongly associated with dramatic reductions in heart disease, diabetes, and even cancer. “The results also demonstrated a robust correlation between improved cardiovascular health and telling acquaintances that while avoiding bacon would be hard, it wasn’t like you were eating a steak every night to begin with. In addition, the positive relationship between browsing vegetarian cookbooks and restaurants online and overall longevity seems especially promising.” The researchers went on to state, however, that the benefits of considering a vegetarian diet still paled in comparison to those enjoyed by individuals who inform friends they were now officially meat-free and haven’t had a burger in more than a week.